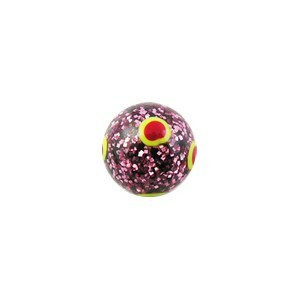 Hand-painted body-piercing ball for the tongue with red and yellow circles on a spangled pink background. This body jewel acrylic spangled red/yellow circles barbell ball made in Acrylic, of Round shape, with Red as the predominant colour, and with Yellow as a secondary colour is proposed to you in 1.6mm/14G size and with a 06mm ball. There are 5 other versions of this product: white/blue flower, white/yellow flower, yellow/red flower, black/white stars and red/orange stars. This product is often bough with black tragus/lip piercing bar ring stud w/ turquoise rhinestone and acrylic spangled yellow/red flower barbell ball.